Orange Hill is a beautifully appointed 1st floor apartment with a spacious sunny verandah overlooking the 2nd fairway of Rockley Golf and Country Club. 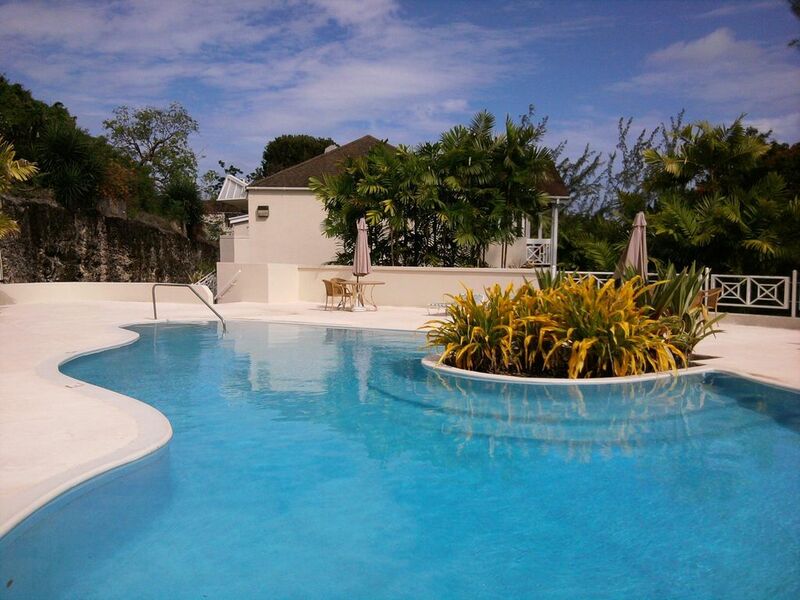 Adjacent to the property there is a calm and peaceful swimming pool for exclusive use of owners and their guests. It is a 15 minute walk from Accra beach which offers soft white sand and crystal clear waters. Nearby is the famous St. Lawrence Gap offering vibrant nightlife and entertainment in its bars and restaurants. Duty free shops, banks and supermarkets are within walking distance. Rockley is a challenging 9 hole par 35 course. One guest is entitled to complimentary membership throughout their stay. There are also 4 floodlit tennis courts and an informal restaurant, Fairways, situated within the peaceful grounds. The apartment comprises 2 spacious bedrooms and a living room all with A/C and all opening out onto the verandah with views of the golf course. There is a ceiling fan in each bedroom and in the lounge. Hello. My name is Kathryn and I am married to Colin and we have 2 children. I lived in Barbados in my early teens and went to Queens College and loved the island. In the '90s we went back to Barbados as a family for holidays a number of times and stayed in Rockley. Again we loved every minute of it and so bought our beautiful apartment so we could spend more time here. We stay there frequently and love the apartment, its peaceful location and the island life. We have now decided to let it out and hope that our guests will enjoy their stay as much as we do. Your stay can be as peaceful or lively as you desire due to the diverse range of experiences that the island has to offer. In our last holiday we enjoyed playing golf and tennis, dining out at a couple of lovely restaurants, drinking at local rum shops, went to a couple of quiz nights at the golf club restaurant, enjoyed a fantastic sunset cruise, took a submarine trip, flew kites with the locals at the Garrison, visited Graeme Hall Nature Sanctuary and of course chilled out by our pool and on Accra Beach and that was all in the space of a few weeks. Both bedrooms have modern en-suite bathrooms with shower, wc and sink. There are also walk-in rooms with fitted cupboards, drawers and wardrobes attached to both bedrooms. The light and airy open plan lounge has french doors opening out onto the verandah. There is a double and a triple sofa. There is also a flat screen TV with cable and DVD player, free Wi-fi internet and telephone with unlimited local calls. There is a modern fully fitted kitchen with granite work tops, cooker, hob, fridge freezer, dishwasher, washing machine, tumble dryer and microwave. There is a breakfast bar with three stools. There are three stools in the kitchen and a table and four chairs on the verandah. The golf course is our garden! There are floodlit tennis courts on site. The apartment overlooks the second fairway of Rockley Golf and Country Club. This is the oldest course on the island and has hosted the Barbados Open. It is a friendly 9 hole par 35 course with thriving social and competitive sections. Alternative tees are available to provide for 18 holes of 5610 yards. The members are drawn from the local community and also property owners. The Pro Shop hires out clubs, trolleys and buggies if required and the club restaurant organises a quiz night every week. Complimentary golf is provided for one guest throughout their stay. For subsequent guests, fees are approximately £115 for one week or £200 for two weeks unlimited golf or £32 for 18 holes. Royal Westmoreland, Sandy Lane and Barbados Golf Clubs are all within driving distance. The pool is only used by the four small blocks at Orange Hill and is invariably quiet and peaceful. It's just down the steps from our apartment, about 20ft away! Notes on accommodation: Please contact owner. Outside: The large verandah has a dining table and 4 chairs. The large and secluded swimming pool is situated adjacent to the apartment and is shared amongst the apartments but is invariably peaceful. The property is set on 70 acres of beautiful gardens surrounding the course. A weekly maid service is included and towels and bedlinen are changed. The management company is onsite so can always give you immediate assistance. Incredible! Better than we could have imagined!! We have been to Barbados multiple times, staying in hotels on every other occasion. This was by far the best choice we have ever made. The check in process was SO simple and easy, something I was slightly concerned about, being the first time not staying in a hotel. The accommodation was fantastic! A lot bigger and more spacious than we thought. So clean and tidy! Brilliant balcony overlooking the golf course... we basically had the pool to ourselves every day. Colin the owner was amazing... he answered every query I had, and put all my concerns at ease. 100% recommended, and we will definitely be returning!!! Thank you so much Jessica for your kind review. I am so glad that I could put your mind at rest during the booking process and that you enjoyed your stay. I was more than pleased with the accommodations provided by Colin. Check in was a breeze as I only needed to collect the keys from the office and let myself into the unit. Everything was clean and in reasonably working order. The only issue that arose was that when the A/C unit in the master bedroom was turned on water started dripping from the vent in the ceiling. I informed Marcia the property manager and placed some towels on the floor under the vent. I didn't find this to be much of a burden, so I won't dwell on that. We had no other issues at all. We were provided with an ample amount of clean cookware, dishes, cutlery, towels and linens. The Wi-Fi and cable worked perfectly and the beds were comfortable. The balcony was perfect for an evening dinner or a refreshing drink and the in unit washer and dryer proved to be a great convenience. The shared pool was just steps away from our unit and parking is clearly marked. Colin was easily reachable as was Marcia the property manager. I would rent from Colin again in a heartbeat. Thank you very much for your comments and I am so glad that you enjoyed your stay. We have had the A/C professionally repaired so you will experience no problem when you next return. The property managers are always on hand and nothing is too much trouble for Marcia. We stayed here in March of this year and wouldn't hesitate to recommend both the apartment and the area. The apartment overlooks the golf course and the balcony is vast giving great views across Rockley. It was bliss to sit there in the evening with a rum or two! Being able to wander down to the pool within seconds or across to the clubhouse for dinner in just a few minutes was an added bonus. The bedrooms were very sizeable and the apartment was cool, clean and very bright. We had a wonderful time! I'm so glad you enjoyed your stay in our apartment. It's good to know that other people enjoy it as much as we do! We look forward to welcoming you back. We stayed here in March of this year and wouldn't hesitate to recommend both the apartment and the area. The apartment overlooks the golf course and the balcony is vast, giving great views across Rockley. It was bliss to sit there in the evening with a rum or two! Being able to wander down to the pool within seconds or across to the clubhouse for dinner in just a few minutes was an added bonus. The bedrooms were very sizeable and the apartment was cool, clean and very bright. We had a wonderful time! My wife and I had a great stay here after a couple of hectic months at work and it really was the perfect tonic! The en suite bedrooms are spacious and both lead on to the sizeable veranda, with its great views over the golf course (and its varied wildlife!) making it a perfect area to relax, either over a leisurely breakfast or with a drink in the evening. The main living room benefits from a nice through breeze and the kitchen suited all of our needs, although on most evenings we ate at one of the numerous nearby restaurants in either St. Lawrence Gap or around Accra Beach. The pool, which is for the exclusive use of Orange Hill guests, is no more than a few metres from the front door and is a great alternative to the excellent nearby beaches if you really are feeling (incredibly) lazy! The apartment was clean and tidy as one would expect and really provided a great base for us to relax for the week, while the owners were happy to answer our queries in the lead up to our stay. Thanks so much for a great break that delivered everything as promised!!! We had a lovely stay here in mid March. We have been to Barbados before and stayed in a hotel at nearby Accra beach but this was much more preferable, with its great views over the golf course and extremely tranquil setting. Accra beach itself is actually just a leisurely 10 minute walk away and we treated ourselves to a couple of long days by the sea when we first arrived to “acclimatise”! We were even able to have a nice meal and a few drinks at the golf club on the first night to shake off the jet lag – it’s a five minute walk from the apartment. The apartment itself is excellent – there are two bedrooms, both en suite, separated by a spacious living room area and kitchen. Most of the time though we sat out on the veranda, which was lovely for breakfast, as you could watch the birds come and go and enjoy looking down on the golf course from its slightly elevated position. It was also a perfect setting for a drink underneath the stars in the evening and felt like having an extra living room, all adding to a spacious feel overall. Despite the proximity of the nearby beaches and restaurants (Champers and Tapas were our favourites! ), it was great to be able to lounge round the pool for a few hours on the day of our flight back - it was amazingly quiet and well maintained, as it is for the exclusive use of those staying in the small number of Orange Hill apartments. I would definitely recommend this apartment and look forward to visiting again. It is a 15 minute walk to Rockley (also known as Accra) Beach with its pure white sand and crystal clear water. It's also a 15 minute walk in the opposite direction to Worthing Beach where most days you can see turtles swimming close to the shore. Barbados has a huge variety of beaches, lively ones with loungers and bars, to secluded empty ones. There is one on the southeast coast dedicated to kite and windsurfing. The sea and beaches differ on each coast; there's one for everyone! Barbados is relatively small so it's easy to reach the rugged north to see the waves crashing on the cliffs and walking through the rainforests of the interior is an adventure. The Barbados National Trust is very active and arranges walks every Sunday to places you would find it impossible to walk on your own. They also arrange weekly Open House days from January to March. There are fabulous tropical gardens to visit - I recommend a picnic at Hunte's Garden, which is in the interior, whilst a visit to Graeme Hall Sanctuary a 20 minute walk away is also a must. Grantley Adams airport is only 15 minutes drive or taxi drive away. Car hire locally is easy and there is a dedicated parking space for the apartment. Public transport is, however, safe and excellent. The fare is just BDS$2 no matter how long the journey is. You can travel the length of the island for this! Historic Bridgetown is 10 minutes drive. Along the way you pass the racecourse which is situated in the Garrison with many historic buildings, including the Barbados Museum, Drill Hall, George Washington House and the home of the Main Guard where you can watch the Changing of the Guard on a regular basis. The local Massy supermarket is 15 minutes walk away, it has a very good range of food and and also has a bank inside. The post office is situated next door. Car hire on the island is easy and there is a petrol station just next to the supermarket. Booking Notes: A 30% deposit is required at the time of booking the property and the balance due 12 weeks before departure. Cancellation policy: Full refund up to 12 weeks before departure, 50% refund between 6 and 12 weeks before departure, no refund thereafter unless we can relet the property. Changeover Day: Arrival and departure days are flexible. Notes on prices: Please contact owner.